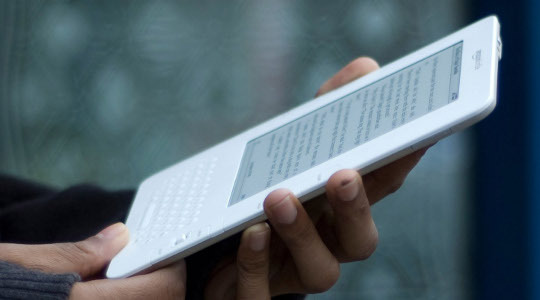 Amazon.com announced a few days ago that Kindle users would be able to lend books to other Kindle users. I cannot say that I was surprised by this move, as its competitors are farther down the road than Amazon. What did surprise me was the allowance of Kindle applications to participate in the lending program. I feared Amazon would restrict this to device owners as a way to promote device sales. What is truly disappointing is the single lend rule. It is reasonable to restrict a book lender from reading a book that has been lent and limit the duration of a loaned book. However, I find the restriction of only lending a book once ridiculous. I really do not see why such harsh restrictions are being levied at the very users who are promoting content to other users. Maybe, I am just reading the site wrong. Maybe, it is only a limitation on the number of times you can lend the same book to the same person. Time will tell, as the posting by Amazon is rather short and does not offer any concrete details of the program. How many times have you lent a single book that you purchased? I must say that I am not a very big lender of books and have only lent a few books in my entire life. I am protective of my books, and I like to keep them in good condition. I always fear a book will be damaged by some careless recipient of my lending generosity. Well, with the advent of e-books, I no longer have to worry about damage to a physical book, but now I am still highly restricted on what I can do with a book I purchased. The publishers have complete control in the Amazon program and can prevent their content from participating. In traditional publishing, they could never exert this kind of control. From a business model, it still seems as if the publishers are only coming to the e-book market reluctantly while kicking and screaming just as the music industry did. One day, I wish somebody would sit me down and explain why e-books and liberal lending policies are bad for the publishing business. The other good news coming out of Amazon is the expansion of its Kindle applications to support periodicals. The lack of periodical support in the Kindle applications was a serious shortcoming that I am shocked was not addressed many months ago. The periodical publishers have been flocking to the iPad and Amazon might be seeing their subscription rates being impacted. Amazon completely owned the e-book market and could have built a complete iron fence around the industry. Unfortunately, visionaries do not always execute well. Looking back at the record of Amazon’s Kindle, we can see a lot of business that was left on the table because of bad business decisions, design challenges, and overly restricting consumer usage rights. Why don’t we have a single e-book or digital rights standard by now? If I buy a book from (insert company name here), I cannot use it on a competitors’ device. This is still the biggest fundamental failure in digital book publishing and one that must be resolved to promote industry growth and protect consumer choice. While I wait for this reality to enfold over time, I will just have to curl up with my Kindle and read a good book.